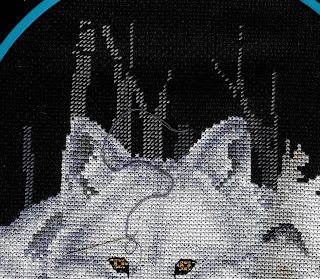 I decided today that I was going to work on my wolves and do a bunch of the half stitches that make up the background trees....this was so I could see progress in a hurry as it seems I stitch and stitch on everything and nothing is progressing as fast as I would like. I did about three lengths of thread only to realise after it was the wrong shade and the FROG fairies and I are going to have a ripping good time tonight. I was just going to leave it but they are for sure too light in colour so they have to come out... 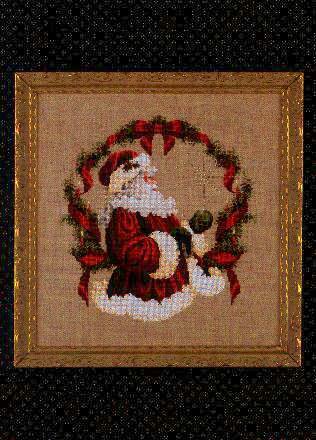 So all the half stitches you see below are on their way out. Oh no I'm sorry you've been visited by the frog. I hope you can get it fixed and re-done quickly. Sorry to hear that you and the frog are spending time together! Hope you get back on track soon and can keep that little nuisance away!! The Wolves look fantastic by the way!